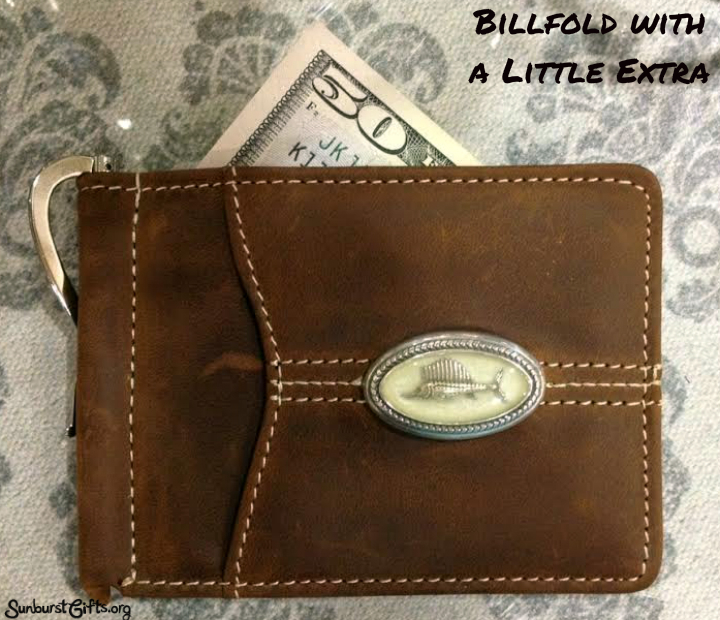 My husband likes to receive a new billfold every couple of years either for his birthday or Christmas. It’s always on his list because he doesn’t like his billfold to look tattered and worn. Randy specifically prefers trifold wallets. 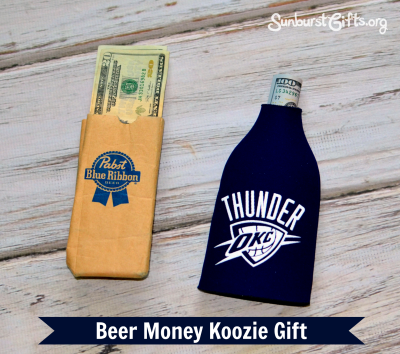 Over the years, my mother took over the billfold gift giving. She liked giving him what he wanted, but she didn’t like him knowing what the gift was going to be. She was all about the surprise. So she would place different amounts of cash in the billfold. Her favorite type of billfold contained hidden compartments or zippers where she could hide the money. Just What the Dr. 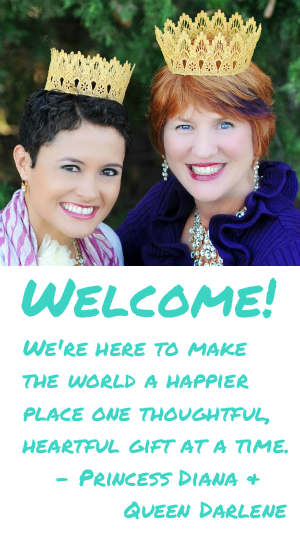 Ordered – Money! 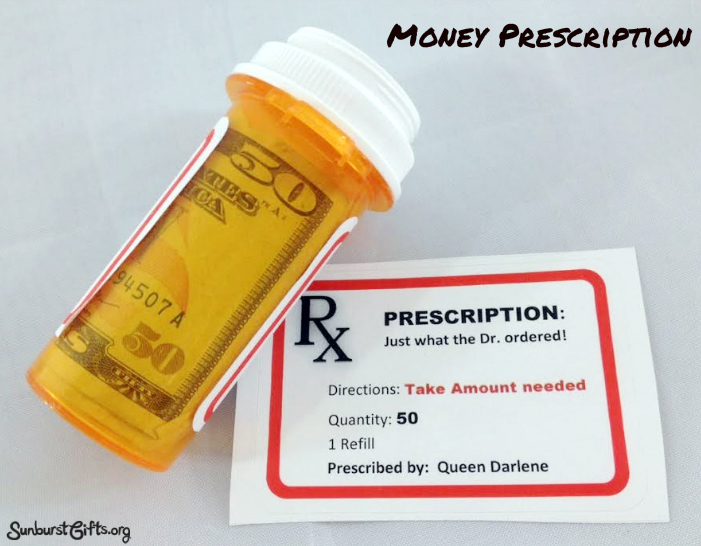 I love to give money in unexpected gift containers and a prescription bottle certainly makes for a surprise dose. This is one of the easiest gifts to make. Just for the asking, my pharmacy provided me with a new prescription bottle free of charge. To give you a couple of ideas, I created two different labels. One on a sticky mailing label and one on plain typing paper. Want to give the perfect women’s gift? You can’t go wrong with chocolates and money! I love this saying – Money Talks, Chocolate Sings! Give the special woman in your life what she loves – mouth-watering chocolates and a little extra money. Princess Diana has written a post about the importance of a fire and waterproof safe. My gift idea includes giving a fire and waterproof safe with money and candy inside! Surprise! 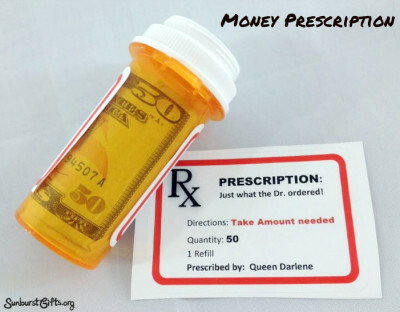 Many people usually stash a little cash somewhere in their homes for emergencies. And no…under the mattress isn’t a good idea. 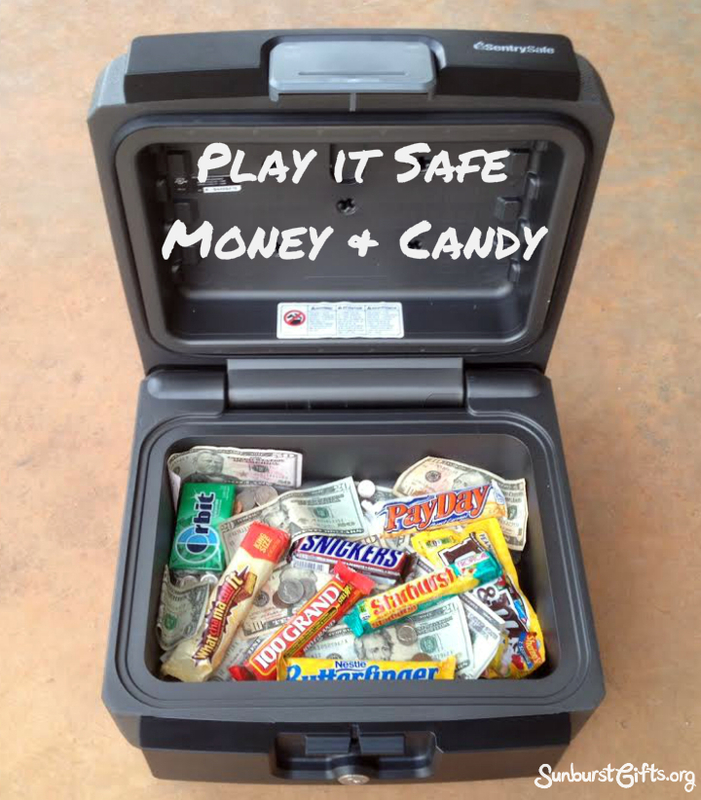 So why not play it safe and give someone a fire and waterproof safe as a gift? 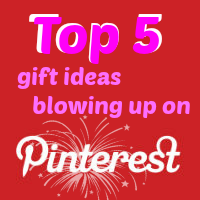 For a thoughtful twist include money and candy to give it that WOW factor! 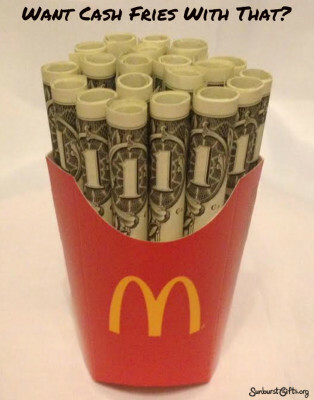 Want Cash Fries With That? Drive through McDonald’s, order a hamburger and drink, and what do you immediately hear through the speaker? Want fries with that? No one would refuse! Unlike French fries, Cash Fries contain zero-calories making them the perfect and clever way to give money! Getting to drive is what makes turning 16 so sweet! A driver’s license equals freedom and independence… if you happen to have both a car and gas money. Thanks to my parents, I had a car to drive. But until I found a part-time job, I was strapped for gas money and could only fill my gas tank $5 at a time. Many teenage drivers feel the same pinch when it comes to gas money and probably even more so with today’s higher fuel prices. That’s why gas money and gas cards will always be a thoughtful gift for high school and college students. 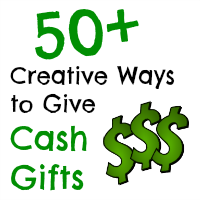 But let’s not be boring by giving cash in an envelope. Presentation and the element of surprise go a long way when giving cash. Women love to have comfortable shoes, especially slippers to wear around the house after a long day. Give the gift of comfort while hiding some money in the toes of the shoes. 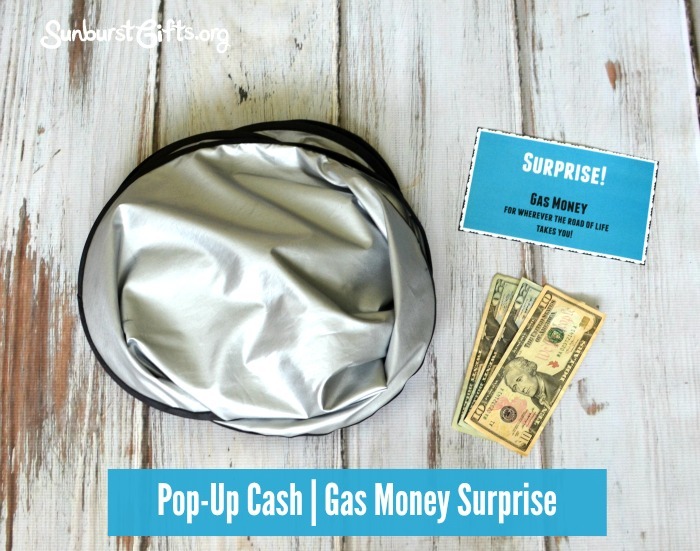 Don’t give the surprise away! 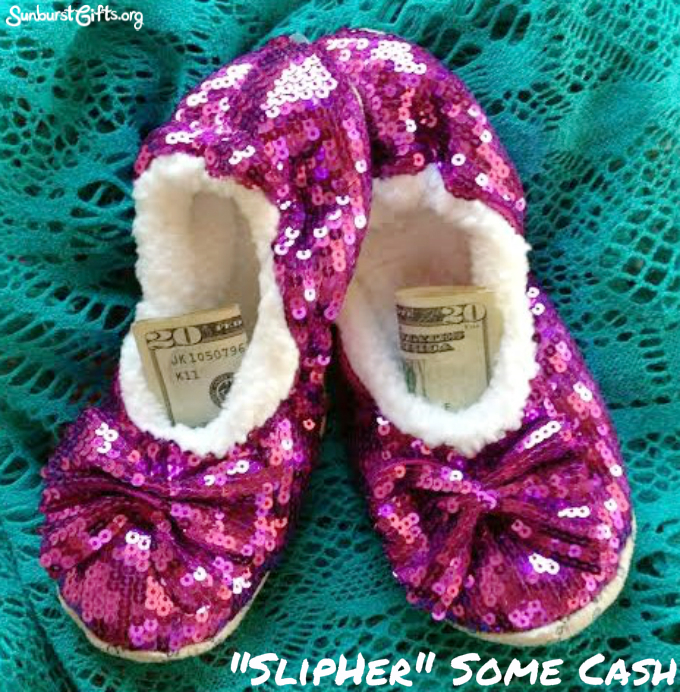 Let her discover the cash on her own when she tries on her new slippers. Instant cash will give way to an instant smile! Wearable money gifts. It’s a thing! There are Money Leis, Money Chains, and now Money Crowns for the prince, princess, king or queen in your life. 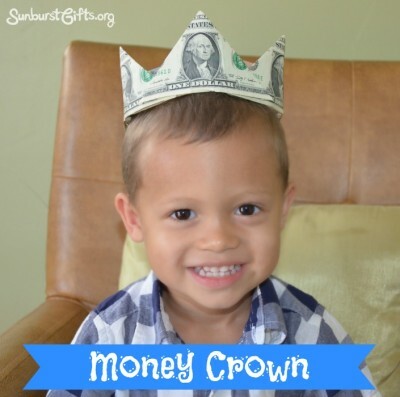 Money Crowns look striking, and it’s something the birthday girl, birthday boy or graduate can wear on their head during their party! My Mother started this Madness of Masking Money as M&M‘s Minis. Mom loved being a grandMother to My two boys. One of her favorites was Making things different than they appear. 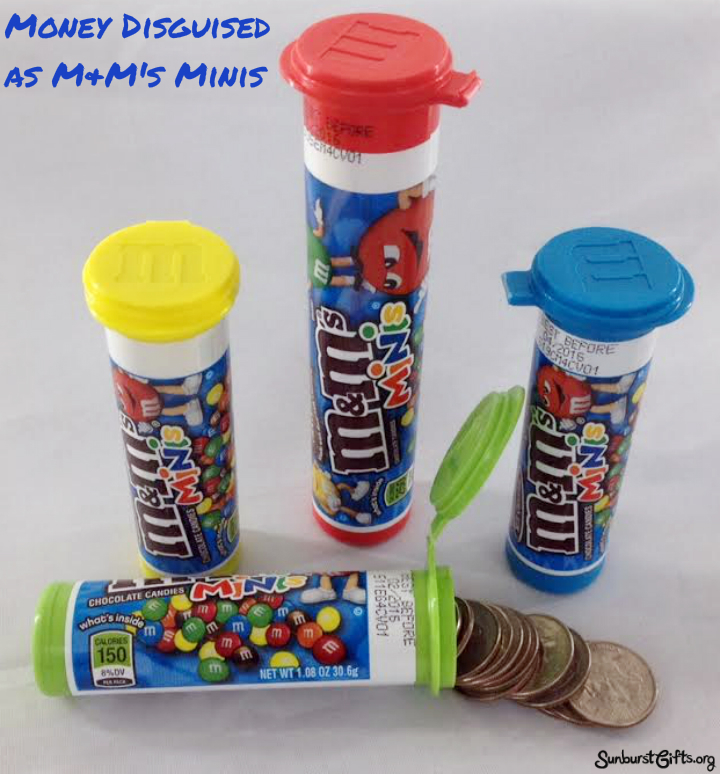 Want to know how she disguised Money as M&M‘s Minis? She purchased the M&M‘s Minis that come in a cylinder tube and reMoved all of the M&M‘s Minis. I think she Munched on them until there were no More. The cylinder’s round opening is the perfect size for filling the tube with Marvelous quarters. The small tube holds 56 quarters of Money worth $14 and the mega tube holds 72 quarters of Money worth $18.